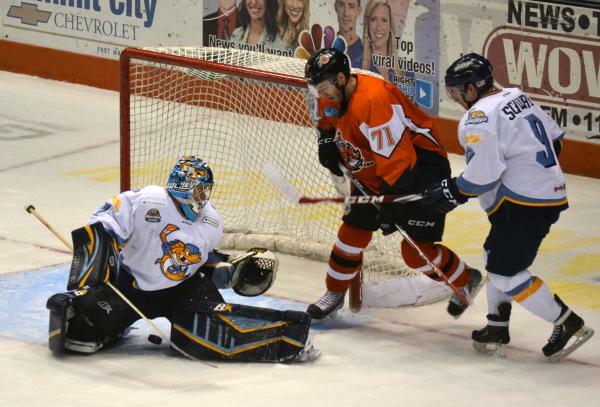 Toledo ends Fort Wayne's winning streak, but Komets keep division lead. Sometimes things just don't go right. A bad pass here, a bouncing puck there, and all of a sudden things turn. Toledo is a fast, aggressive, move the puck team. Their style doesn't match up well against the way the Komets like to play. But after adjusting to the speed of the game, the Komets played pretty well ( even accumulating a three goal lead). After (what? ), five games in six nights, Toledo came into town and played hard. I'm sure Coach Graham is working hard how to solve the Walleye. Even as a Komet fan, I think you have to respect Toledo for not quitting when down 3-0. Maybe I'm just totally way off base, but it just seemed that Nagle was "fighting" the puck all night long. I'm not criticizing. Everyone will have "off" nights...and he made some great saves also. Toledo is a small (smaller than the K's) team. Sometimes I wonder if the Komets wouldn't do well acquiring a small (5'9"-5'10"), quick forward with good hands. I'm not trying to argue against the success they've shown (18-4-1-0), just wondering if it could help them match up against Toledo. As it stands now, these two teams will be battling it out for the division. Glad to see Severyn score. Glad to see Perlini score also.